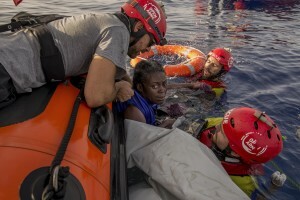 On July 17, 2018 a rescue boat operated by Spanish NGO Proactiva Open Arms saved a Cameroonian woman and found the bodies of a child and another woman in the Mediterranean Sea. 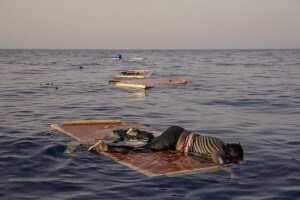 The aid group accused Libya’s coast guards of abandoning the three on Tuesday after intercepting some 160 migrants. 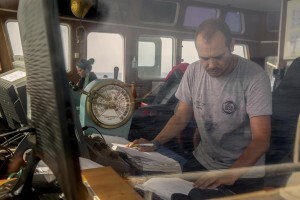 Proactiva Open Arms director Oscar Camps said the two women and the child had refused to board Libyan vessels with the rest of the migrants and had been left behind. They had been at sea for two days and two nights. A member of the Spanish NGO Proactiva Open Arms carries a dead child about 85 miles off the Libyan coast in the Mediterranean sea on July 17, 2018. 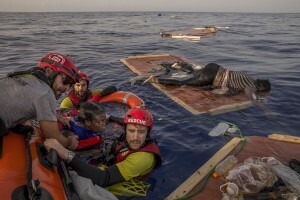 Members of the Spanish NGO Proactiva Open Arms rescue Josepha, an African migrant from Cameroon, while the body of a woman lies on a piece of drift wood about 85 miles off the Libyan coast in the Mediterranean sea on July 17, 2018. 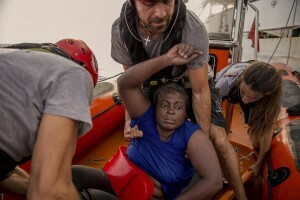 Members of the Spanish NGO Proactiva Open Arms rescue Josepha, an African migrant from Cameroon, about 85 miles off the Libyan coast in the Mediterranean sea on July 17, 2018. The body of a woman lies on a piece of drift wood as members of the Spanish NGO Proactiva Open Arms rescue her floating body about 85 miles off the Libyan coast in the Mediterranean sea on July 17, 2018. 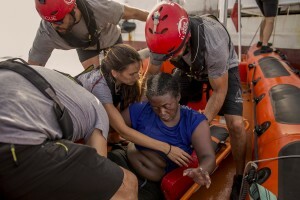 A crew member of the Spanish NGO Proactiva Open Arms rescue boat embraces Josepha, an African migrant from Cameroon, in the Mediterranean sea on July 17, 2018. Members of the Spanish NGO Proactiva Open Arms rescue boat carry Josepha, an African migrant from Cameroon, in the Mediterranean sea on July 17, 2018. NBA Memphis player Marc Gasol and members of the Spanish NGO Proactiva Open Arms rescue boat carry Josepha, an African migrant from Cameroon, in the Mediterranean sea on July 17, 2018. 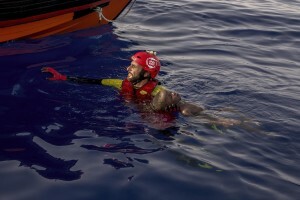 A member of the Spanish NGO Proactiva Open Arms and NBA Memphis player Marc Gasol at work after the rescue of Josepha, an African migrant from Cameroon, about 85 miles off the Libyan coast in the Mediterranean sea on July 17, 2018. 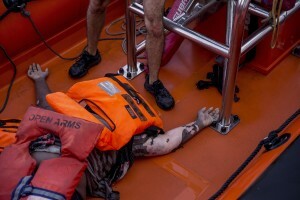 The body of a woman is covered after being removed from the Mediterranean sea by members of the Spanish NGO Proactiva Open Arms about 85 miles off the Libyan coast in the Mediterranean sea on July 17, 2018. 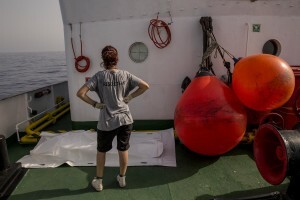 A doctor of the Spanish NGO Proactiva Open Arms looks the white bag containing the body of a child found dead about 85 miles off the Libyan coast in the Mediterranean sea on July 17, 2018. 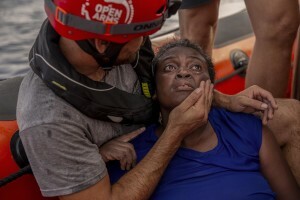 A doctor of the Spanish NGO Proactiva Open Arms takes care of Josepha, an African migrant from Cameroon, rescued about 85 miles off the Libyan coast in the Mediterranean sea on July 17, 2018. A general view of the “Astral” ship of the Spanish NGO Proactiva Open Arms in the Mediterranean sea on July 17, 2018. Captain of NGO Proactiva Open Arms rescue boat Marc Reig Creus at work in the Mediterranean sea on July 17, 2018. 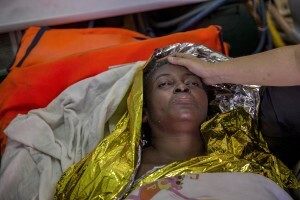 A member of the Spanish NGO Proactiva Open Arms rests on a sofa inside “Astral” ship after the rescue of Josepha, an African migrant from Cameroon, about 85 miles off the Libyan coast in the Mediterranean sea on July 17, 2018.